Call 1-800-450-5319 or fill out our form for a FREE quote and information on auto shipping to the Bahamas with A1 Overseas International! Shipping a vehicle to another state is a much easier undertaking than shipping a vehicle to another country. 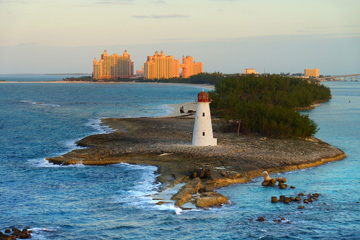 Even shipping to the Bahamas requires a more detailed international auto transport process. The technicians at A1 Overseas International will assure that all facets are addressed properly for a smooth transport. Before you send your vehicle to off to the Bahamas, make sure that it complies with their auto import regulations. Call the Embassy of the Bahamas for the current import policy in place. They will tell you of all the proof needed for Customs and what types of vehicles are permitted into the borders of the island region. RO/RO shipping services will require an emptied out vehicle so it can be affixed to the open top of a flatbed ship. This is the most famous and less expensive of all the transport services. Enclosed transport is the point at which the vehicle is put inside a vast transport container. The vehicle will be permitted to have belongings inside. The unfilled compartment space can likewise be permitted to harbor assets. These belongings must be permitted through Customs as well. Air transport is a third alternative, however it isn't offered by numerous overseas transport services because of its much higher expenses. Not many people can bear the cost of this transport service. Regardless of the transport service you choose to export your vehicle with, you can assure it will be safe and sound during its journey. If something were to happen, the shipping company will have their insurance policy cover the damages or replacements.